View More In Link Kits. 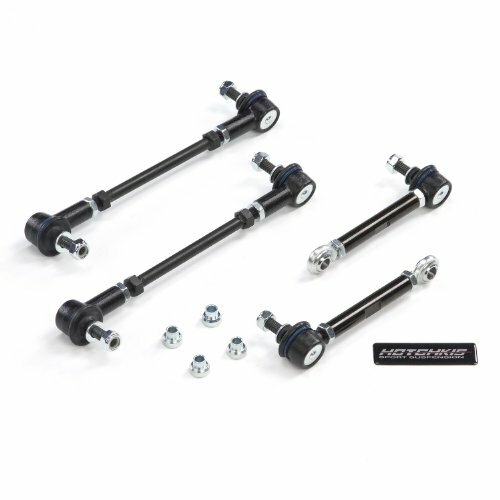 Hotchkis Sport Suspension 2007-2009 BMW E90/E92 330/335i Front and Rear Sway Bar Endlink Kit. Many E90/E92 BMW 3 Series, and M3 owners choose to upgrade their cars with stiffer sway bars, but often these upgrades can cause the factory end links to fail. Seeing this need during sway bar development, Hotchkis Sport Suspension has met this challenge with the Sport End Links which use a combination of high articulation rod ends for maximum range of motion, and quiet, greasable polyurethane bushings for comfort. These Sport End Links make a great addition to any BMW sway bar upgrade. These end links are available separately, for those looking to upgrade competitors systems, or factory bars. For the ultimate in performance take a look at the Sport Sway Bars sets as well which come complete with upgraded end links. Features: Specifically is designed for the BMW E90/E92. High articulation rod ends for maximum range of motion Quiet, greasable polyurethane bushings for comfort. Height adjustable for optimum fit. Front Length Range: 11.5 inch ± 0.5 inch Rear Length Range: 6.375 inch ± 0.5 inch. Increased sway bar effectiveness. Maximum range of motion. Increased end link strength. If you have any questions about this product by Hotchkis, contact us by completing and submitting the form below. If you are looking for a specif part number, please include it with your message.